Chef Head Scarves ~ Head Wraps ~ Doo Rags. High Quality Chef headwear made in America. 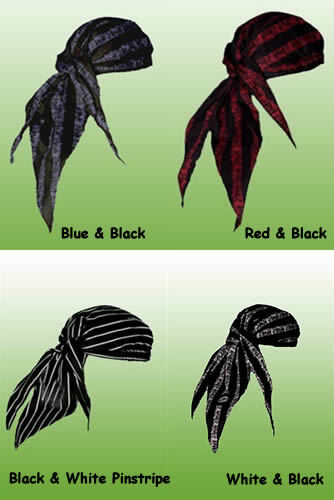 You can call these doo rags, bandanas, head scarves or head wraps. It doesn't matter. What does matter is that these are great, affordable, and nice quality head wear for chefs and kitchen staff. One size fits all on these ready to wear wraps. There's no need to fuss with trying to tie these so they look good. They're made from 100% cotton fabric, and are made in America. They are fitted with a soft and absorbent terrycloth inner head band. That helps keep your forehead dry and cool, while you keep your styled good looks! Read more about the head wraps. These combo packs are great when you want to get the best deal on chef head wraps. Each color striped combo pack has 1 of each of the 4 striped designs. So, you get a head wrap in blue and black striped, red and black striped, white and black striped, and black and white pinstripe. 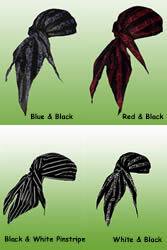 All our doo rags, as they're also called, are made in the USA from 100% cotton fabric. They are one size fits all and come ready to wear. No more fussing with getting these tied correctly! The inside band that goes across the forehead has a soft and absorbent terry cloth inner band, helping to absorb perspiration and keep you dry. Read more about the doo rags. * Love these chef head scarves but live outside the US? Contact us, tell us where you live and what you want to buy and we'll send you an exact shipping quote. You work hard for your money, so why not spend it on quality goods? These head wraps are made in the USA. (Yes, there are still excellent clothing manufacturers in the US!). The wraps are made out of a nice quality 100% cotton fabric, and are well constructed. Consider giving these a try next time you need to buy yourself or your staff new head wear for the kitchen.